Here on this page you'll find an overview of all My Little Pony Paperback Issue νm; 6 Comic Covers, with a total of 1 release. You can click on the Paperback Issue νm; 6 Comic Covers images to zoom in or click on any of the links under the images to see more releases of that type. 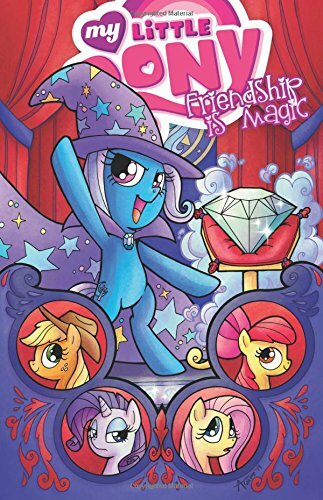 Summary: Applejack, Rarity, and Fluttershy visit Manehattan to see Trixie's magic show. Meanwhile, in Ponyville, the ponies' pets, Angel, Owlicious, Gummy, Tank, Winona, and Opal must save the day. Plus, Discord takes Fluttershy and the Cutie Mark Crusaders on a trip through time!